"'Because of how distinctive Bourbon County Stout is, that super malty finish, we really wanted to see just what would happen to it,' says Rhine Hall co-owner Jenny Solberg Katzman. 'It's really fun to see how big of a correlation there is between the beer and the distilled version of it.'" Could Apple Brandy Be Headed for a Rye-Like Renaissance? "Guests may have superficial and vague notions of brandy as something one sips from a crystal snifter after a white-tablecloth meal, but beyond that, little actual knowledge of what the spirit is. Rhine Hall challenges these musty stereotypes with its branding: Katzman explains that the clean, modern aesthetic of the labels is meant to 'bring a little bit of youth to the product category.'" "Open a little more than three years, Rhine Hall, Chicago's first brandy distiller, now serves its 10 annual products—ranging from fruit brandies to grappa—in more than 300 restaurants, bars and stores throughout Illinois and a handful of other states." "Bartender Jeremy Barett of Chicago’s Annex at GreenRiver praises the spirit’s ability to be at once 'delicate and smooth, while packing a powerful and flavorful punch to any cocktail.'" "Whether you call it by its official designate, the Kinzie Industrial Corridor, or its more popularly known moniker, West Fulton Market, this planned manufacturing district has exploded among makers and creators in the food, beverage and retail arenas." 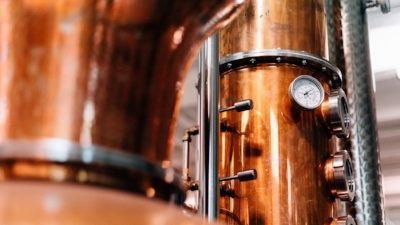 "Copper & Kings, for instance, ages its brandy in Kentucky bourbon barrels while in Chicago, Koval Distillery and Rhine Hall Distillery are reviving traditional fruit-based brandies and adding new twists like sunchoke, mango and cherry brandy." "When you step into Rhine Hall, there are many things you might notice: the sweet punch aroma of fermenting fruit, steam emitting from copper distills, steel clad vessels, maybe even a patron enjoying a cocktail in the tap room. But beneath all of that lies still more an honest, authentic process and a father-daughter team that is passionate about what they do: making craft fruit brandies." "We really didn’t know what to expect, but after hearing about their authentic distilling process and passionate family story we were sold. 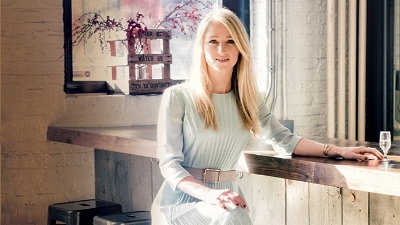 The cocktails were just as wonderful as the conversation and it was at that point we decided to follow the father-daughter team as they continued to grow." "'Rhine Hall apple brandy [Editor's Note: Which is made with local apples] has a very clean, un-aged eau de vie, with ripe, refreshing flavors of apple and a good amount of bite to it,' says John Stanton, lead bartender from Sable Kitchen & Bar in Chicago." "Their beautifully crafted bottles, impeccable branding, and delicious spirits have been popping up all over town and catching our eye...and our taste buds!" 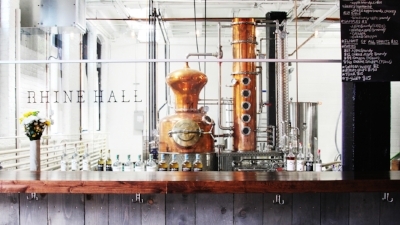 "The most noticeable recent change in Chicago’s drinking scene has been a rise in distilleries, the most exciting of which is arguably Rhine Hall, the brandy distillery owned by Jenny Solberg and her father, Charlie." 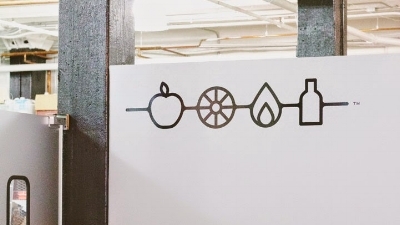 "Made entirely from local Michigan apples (it takes 25 pounds to make a bottle, and Rhine Hall brings in 21,000 pounds a year), this spirit starts with raw fruit and ferments for three weeks before being distilled."